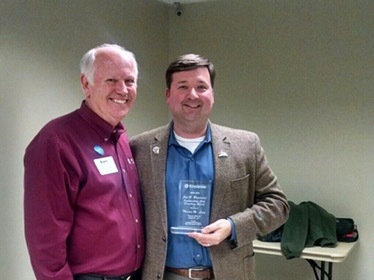 Lafayette Kiwanis congratulates our 2015-16 Club Secretary, Thomas Long, who was honored with the 2015-16 Jay R. Broussard Outstanding Club Secretary Award for the 2015-16 administrative year during the LaMissTenn Regional Mid-Winter Conference held today in Lafayette, Louisiana. This award recognizes Tom as the outstanding club secretary in the entire Louisiana-Mississippi-West Tennesee District. Tom received his award from Past District Governor, Gary Graham. Today, Tom also received his second consecutive Distinguished Secretary Award which qualified him for this honor.